The initial concept for this shoot was to create a scene that had more questions than answers ....what happed to this young woman? Where was this place? What period of time is it set... etc. Theoretically the incident would be set in a remote derelict cottage, the wind howling through the broken window, a fallen tree protruding into the room, water stained peeling wall paper, moss covered stone floor, torn and distressed old curtains etc ..... and there a beautiful young woman stands motionless with a vacant expressionless gaze, windswept from the wind blowing through the broken window. Attention to detail was key so everyone in the team including Harinder Kaur, Peter lennox, Penny Edwards and Dave Weir considered the smallest of details even using real moss between the stone floor and ivy growing through the upturned broken bed frame. 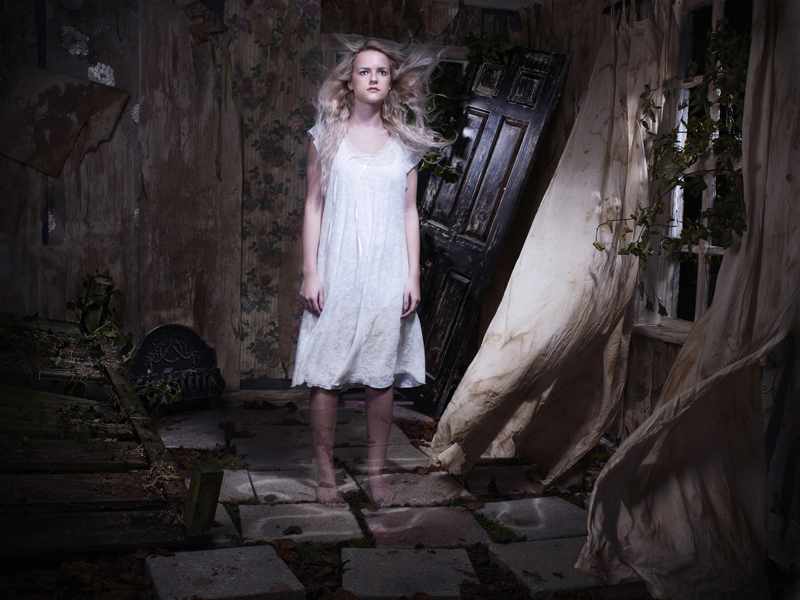 A great deal of work was involved but the aim was to create a realistic set which would covey the ghostly story. The lighting was obviously key to the shot not only to create the illusion of moonlight through the broken window on our model Holly( Miller) but also through the open door at the back of the room and various highlights throughout the room to create the dramatic eerie atmosphere. This was a multiple composite shot so it was essential that the lighting was effective in all areas of the room even with wind machines and wafting boards billowing curtains and the fluttering of the models night dress. A medium format camera was secured onto a large studio stand to ensure there was no movement at all between shots, so each shot could be merged accurately using Photoshop. Poor Holly had to endure standing on freezing cold stone paving....while creepy crawlies emerged from the moss and fallen leaves over her bare feet.....yuck!